Matt and I didn't make it out to the Tiny House Jamboree this year. It made sense at the time - we really needed to stay put after traveling a lot in the winter and spring. But as the event started to unfold we found ourselves longing to be around our tribe. But we were lucky enough to be on the map for Kai Rostchek's return trip. Kai is the mind behind Tiny House Lending and Tiny House Dating, both filling very important roles within the tiny house community. See a guest post I did for Tiny House Dating here. I has spoken to Kai in the past when Drew Odom and I did the Tiny r(E)volution podcast. But that was really about it. Like many friendships in the 21st century we got to know each other in soundbites over social media. And meeting new people in person is sometimes a terrifying thought. Social anxiety gets the better of us and we just want to say, "No thanks, we're good." But never, not once, have we been disappointed after meeting someone else within the tiny house house community. These are our people. Our tribe. In fact, the talk that Kai gave at the Jamboree was about just that. He invited several other tiny housers to help him demonstrate the interconnectedness of our community and it was glorious. I wish I could have seen it. Kai got to see what a tiny slice of life was really like in our house tucked in the woods as we wage a never-ending war against ants who have infiltrated our fortress. Living in a tiny house isn't always glamorous, but big houses get ants too. But he saw the good things too and the things that directly reflected who we are as people. 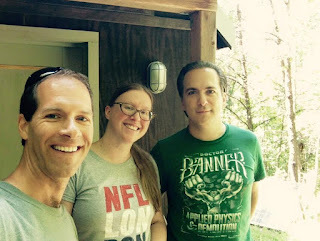 The thing I am most struck by whenever I have an opportunity to meet someone who is involved in the tiny house community is our shared passion for the possibilities of our community. Not everyone has the same personality but we all share this drive for how going tiny can change our lives in the most dramatic, and positive, ways. It is always inspiring to spend time with others who have taken steps on this path. Thanks for visiting, Kai! We will see you soon.